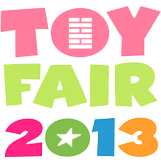 Our live streaming video coverage from Toy Fair starts today at around 1 p.m. EDT! Once again, follow our Tweets for updates and keep an eye on the video player above (or directly on our Qik page) to catch the latest real-time video streams from the show (we'll tweet 5 minutes before we stream). In the meantime, you can enjoy some of our previous live streams from our 2010 coverage.